I trust that your holiday season was filled with smiles, laughter, hugs, surprises, and food that made your taste buds dance. I hope you were having a time of your life – these wonderful memories will last a life time! Now that the hustle and bustle of the holiday celebrations are winding to a close, I believe it would be wise to celebrate The Wonderful You. Take time out of your schedule occasionally to do something just for you. Think: ‘What brings peace and joy to my heart?’ And then just do it. Personally, I love hiking through the woods, especially on a snowy day. It is so peaceful. Choose an activity that helps you clear your mind, and then do what speaks to your heart to bring even greater joy and peace to your life. Remember, we should be tending to the pursuits of growing spiritually, mentally, emotionally, and physically. We are always in process. Enjoy the moment and the process of growing YOU. In the spirit of bringing greater fulfillment to your life, I recommend The Circle Goals Exercise. Draw a circle and divide it into six, even, pie-like slices. The equal slices are to remind you to give equal weight to the life aspects you’ll identify in the next step. If you’re not able to devote equal amounts of time to each area, at least try to dedicate equal energy in mental thought. In each slice, record an area or category of your life that you want to focus on for the next year. Examples would include financial, health & exercise, creativity, career, friendships, family, spirituality, romance, recreation, environment (e.g., renovating the house), or personal development (e.g., learning a new skill). Pick the top six areas that resonate with you. Write five measurable and obtainable goals under each category. Be specific and make sure you will have measurable results you can consider at the end of every quarter. For example, under financial, you might write: “Put all financial information online by June.” For creativity, you might have: “Take an art course from the local university this year.” You get the picture! Keep track of your progress. Note when you take your action steps on a calendar, on a spreadsheet, or a little journal. Hold yourself accountable and pat yourself on the back for sticking to it! This process may take you a couple of hours, and you may end up going back and revising it a few days later, as the process gets you thinking. When you are finished, begin the second part of the process: Quarterly Review and Planning. 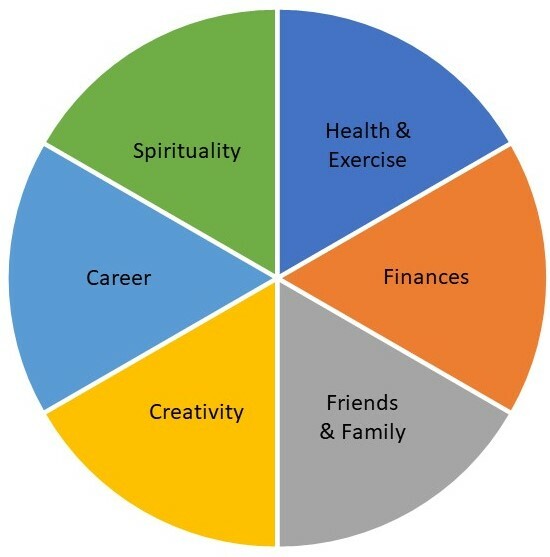 Review your pie chart and pick the one goal that is most important to accomplish this year from each category. Take that #1 goal, write it down, and place it somewhere (e.g., bathroom mirror, desk, dashboard) where it will be a reminder to you every day. After three months, take time to reflect on your Circle Goals again and review it, but make no changes. Reflect on it again at six, nine, and twelve months and appreciate all you have changed in your life. At the end of the year, people tend to discover that they did not accomplish everything in their circle. However, they are also amazed to discover how much of the circle they DID achieve – it’s always more than we thought we could accomplish in a year. Often, we talk about things that are important to us, but then “never have the time” to do them. This process creates priorities and accountability for those things, allowing us to focus and work on the things that truly matter to us. It is my prayer that you develop this ritual and take time to celebrate The Wonderful You in 2018. I would love to hear back from you about your experience with the Circle Goals Exercise. There will be ups and downs during the process, but with perseverance, you will triumph. Looking forward to keeping your well with spinal care and nutrition in 2018!